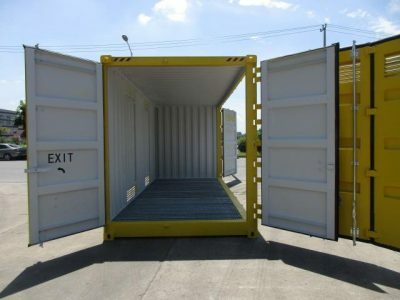 20 ft dangerous goods side open sea containers are specialised, easily accessible containers with the all the security and preventative measures necessary for safe transportation of potentially hazardous materials. These one trip dangerous goods shipping containers have a bi-folding side door that draws back to a 6 metre wide opening, ideal for forklift loading and unloading. These shipping containers feature stainless steel valves, for safe and secure disposal of waste, an emergency exit door, air vents and mesh flooring. All dangerous goods shipping containers are Australian owned, OHS compliant, and compatible with Australian and International standards.